Many species of the exquisite, deep-water family Pleurotomariidae become available in reasonable numbers some 10 years ago due to greater dredging and trawling activity both in the South China Sea and offshore New Caledonia. With this in mind I made a decision to begin a collection of this unique family. 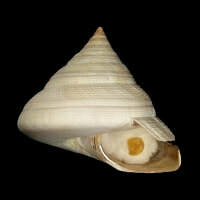 Like many fellow collectors, I had in the past avoided collecting pleurotomariids due to their high prices and lack of availability, but with quite a few species having become obtainable for relatively little money I decided to begin a collection, starting with the more common species, but to try and collect them at a good size, with opercula and in the best possible condition. Please do not think for an instant that all species can be easily obtained as many are still extremely rare, some being known from just two or three specimens, and nowadays there is also a shortage of Caribbean material available from dealers. A few years ago on a trip to Barbados I was lucky enough to meet up with David Hunt, a regular trapper of deep-water shells using baited traps. Unfortunately he had at that time given up this pastime in favour of more lucrative computer work, though he was more than happy to show me the remainder of his collection, as well as photos of some pleurotomariids, including some fantastic specimens of Entemnotrochus adansonianus adansonianus, Perotrochus quoyanus quoyanus and P. gemma (now a synonym of quoyanus but with a taller spire) collected in his traps. 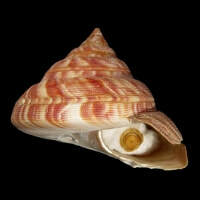 Most of these now reside in the collection of Patrick Anseeuw, a well-known world authority on the Pleurotomariidae. There have been a few new finds in recent years, some of which, I am sure, will remain for a long time on collectors' wish lists only. There are two essential publications available on this remarkable family. 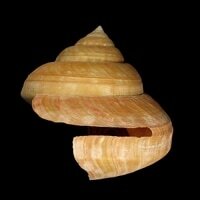 The first is The Living Pleurotomariidae by Patrick Anseeuw and Y. Goto, 1996. The second is Visaya supplement 1, "Pleurotomariidae: An Icongraphic Visit", 2005 by P. Anseeuw and G.T. Poppe. Since I wrote my original articles on the Pleurotomariidae in the October 2006 and October 2010 issues of Pallidula, I have been actively obtaining specimens for my collection, and I would like to share the following images (click on a photo for the full-size image). I have listed the species within each genus alphabetically. 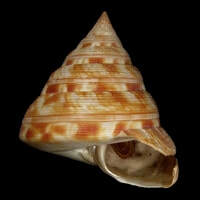 This species is very closely related to B. teramachii. This unique species is usually taken by submersible at depths of around 600m. 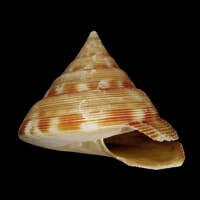 The range of this species throughout the Caribbean is far greater than was originally thought, with specimens having been taken from off Roatan Island, Honduras. 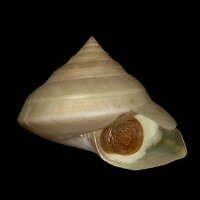 This is the most recently described species in the Pleurotomariidae. 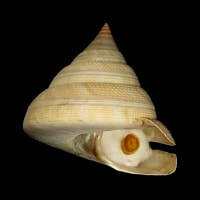 It is endemic to the waters off Balut Island, Philippines, and is very closely related to B. teramachii, differing by its smaller adult size and more rounded and high spire profile. This and Mikadotrochus hirasei are the most common species in the family, but with uncommon varieties such as the pearly white specimen shown in the rightmost photo below. 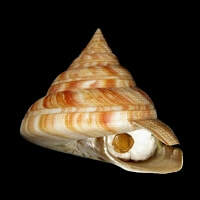 The specimens figured below show well the colour variation within this species, ranging from pearly white in young shells to adults with orange markings; some, like the 96.9mm specimen, are golden. I think this is one of the most spectacular species, with its fantastic colouration and very long, thin and delicate slit. E. adansonianus adansonianus has both high- and low-spired forms. The very rare subspecies E. a. bermudensis is endemic to Bermuda and is known only from dead-collected specimens. 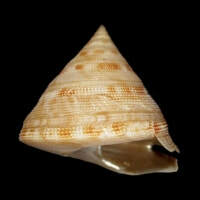 55.4mm, off Garnet Rocks, Bermuda. 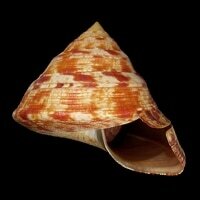 This is certainly a species not to be confused with any other, and is the largest living Pleurotomariid. Juvenile specimens are very beautifully coloured in comparison to adults and, as in many species of Pleurotomariidae, there are high-spired forms and squatter, low-spired forms. 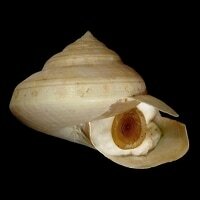 This species has been found living in as little as 30m of water, and is the shallowest-living pleurotomariid. It is endemic to Japanese waters. 79.3mm, Uraga Strait, Chiba Prefecture, Japan. 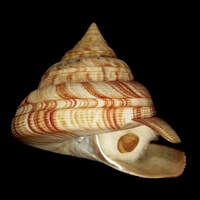 The coloration of this species is very variable, and albino specimens are not uncommon. Zhejiang Province, East China Sea. M. oishii was once thought to represent a hybrid between M. hirasei and B. teramachii, probably due to its similarity to M. hirasei and its larger operculum, like that of B. teramachii. 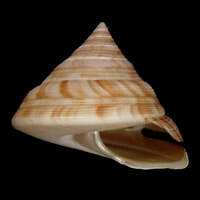 That is of course not possible because these species are in different genera. 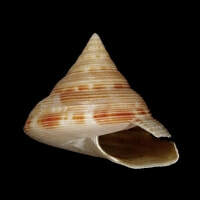 It is now considered a bona fide species, but further study is required. Many consistent differences from M. hirasei have been noted. 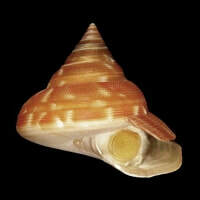 The base of M. oishii is more inflated and the apical whorls are more convex. The selenizone is always sunken in M. oishii, whereas in M. hirasei it is either flush or convex. The very fine sculpture of M. oishii with a less beaded surface is very different from the heavily granulose appearance of M. hirasei. It could be a hybrid between M. hirasei and M. salmiana. This would make sense, but for now I agree it deserves species recognition. M. oishii remains a very rare species, known from just a handful of specimens. 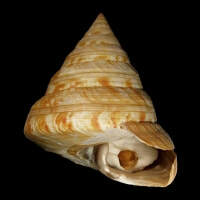 If you compare this specimen with any specimen of M. hirasei, you will see that it has very little granulation, especially on the first whorl, and is more stepped in appearance, somewehat resembling the shape of a giant P. vicdani. 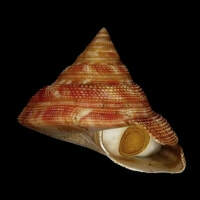 Shells of this specis from Tosa Bay, Japan tend to be larger than those from the East China Sea, and specimens from the Philippines are thinner, lighter in weight and have a darker orange colouration. At the time of writing, the recorded world record size for this species is 135.8mm; the specimen here on the right is larger by 3.5mm. 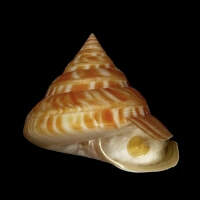 Very pale, almost white specimens occur. 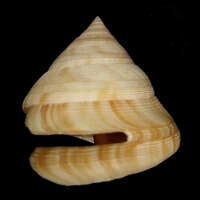 47.3mm, granulose form, north of Belep Islands, New Caledonia. 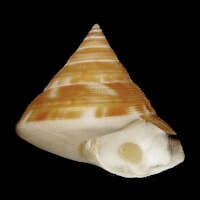 40.5mm, granulose form, north of Belep Islands, New Caledonia. 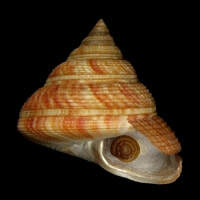 This rare species seems to be related to the granulose form of P. caledonicus. 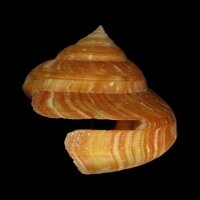 This is a very scarce species, closely related to P. amabilis. 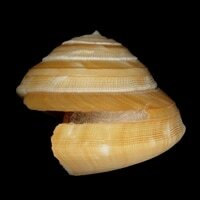 The locality at which this specimen of P. quoyanus quoyanus "gemma" was trawled is unusual for this form. Anatomical and DNA studies may eventually indicate that "gemma" should be a valid species. 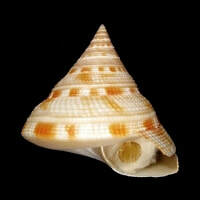 A new population of "gemma" has been discovered in Curacao and the shells have a more strongly beaded sculpture. 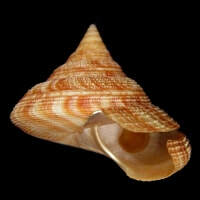 Subspecies insularis is endemic to Bermuda. 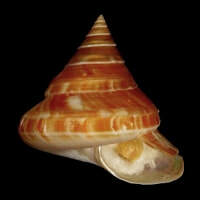 Note the shorter slit compared to that of P. q. quoyanus, the bulging whorls and the inflated, more rounded base. 1. 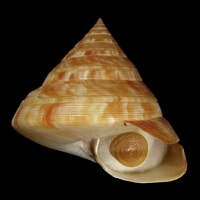 Bayerotrochus charlestonensis Askew, 1987 – an extremely rare species dredged by a research vessel off South Carolina, 80–90 miles east of Charleston from a depth of 750–850ft and currently known from a few specimens only. So far one white specimen is known. 2. 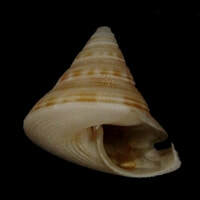 Bayerotrochus boucheti (Anseeuw & Poppe, 2001) – it is difficult to obtain this species, which is closely related to B. teramachii but from southern New Caledonia. Many specimens were originally dredged by a French research vessel, most of which ended up in museum collections. Vincent Crayssac has dredged a small number on his boat the Tui Sarl, which fortunately have found their way into private collections. 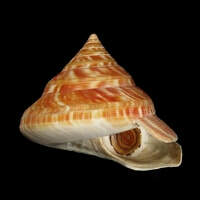 I was very pleased to be able to view a specimen at the Antwerp Shell Show which Patrick Anseeuw had kindly brought along for me to see, and I have to agree that it is very different from B. teramachii, being a superb, bright orange colour marked with striking white flecks, somewhat squatter in shape and with a flatter, less inflated base, and a pink instead of white protoconch. 3. 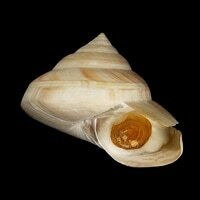 Bayerotrochus diluculum (Okutani, 1979) – known only from Japanese waters. 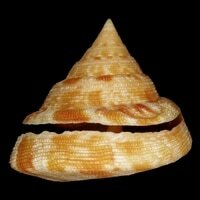 This is another very rare species, closely related to B. teramachii but with a lower, more domed spire profile, white in colour with a smoother surface texture and a more rounded aperture. 4. Bayerotrochus indicus (Anseeuw, 1999) – trawled in the Bay of Bengal, this extremely rare species is known from just a couple of specimens. 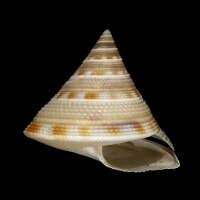 It has a very domed spire and the whorls are quite tall but heavily stepped compared with other species in the genus. 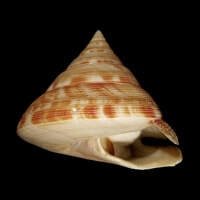 The general shape seems similar to B. midas from Caribbean waters, but the apex of B. midas is very sunken. 5. 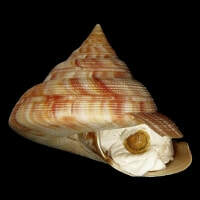 Bayerotrochus poppei (Anseeuw, 2003) – quite recently described and so far only known from two specimens from Tonga, north-west of Tongatapu, trawled alive by the French research vessel N.O. Alis at 501m. 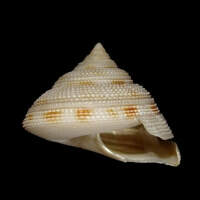 It is a small species, the holotype measuring 53.57mm and the paratype 62.53mm. 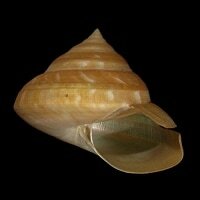 It has a large, inflated body whorl with the rest of the whorls much less stepped. A full description was published in Novapex 4 (1): 11–16, 10 March 2003. 6. 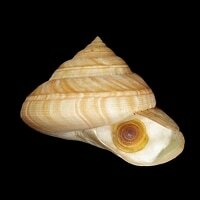 Bayerotrochus tangaroana (Bouchet & Metivier, 1982) – endemic to the waters off New Zealand. 7. 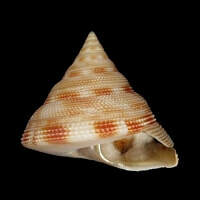 Perotrochus quoyanus quoyanus (Fischer & Bernardi, 1856) – Caribbean. 8. 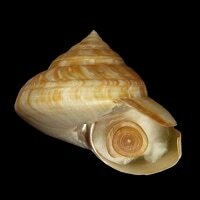 Perotrochus tosatoi (Anseeuw, Goto & Abdi, 2005) – as far as I know, this species is only known from one dead, beaten-up specimen dredged from French Guiana, and it resides in the collection of T. Tosato. The whorls seem to be less step-like than in its closest relative P. atlanticus, but I believe this is the most dubious of all the species of Pleurotomariidae named so far. 9. 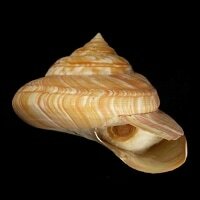 Perotrochus amabilis (Bayer, 1963) – an incredibly beautiful species closely related to P. maureri, but the two species are separated by the Florida Ridge. 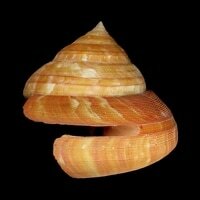 P. maureri is a smaller species, has a lower spire and the selenizone and base have a lesser number of spiral cords. 10. 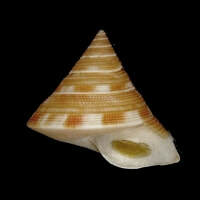 Perotrochus pyramus Bayer, 1967 – quite a unique species whose area of distribution is much greater than originally expected, ranging from the Lesser Antilles through the Northern Antilles and most recently discovered off Roatan island, Honduras, by Carl Stanley with the aid of his new submersible Idabel. 11. 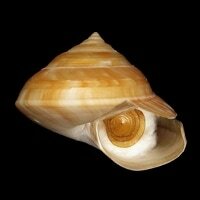 Perotrochus metivieri (Anseeuw & Goto, 1995) – another very rare species, believed to come from the Salha de Malha Bank in the Indian Ocean, though there have been reports of this species from Vietnam and New Zealand. All of the very few known specimens were collected by Russian trawlers, who seem not to have kept accurate locality information (unless of course this species does indeed have a very wide distribution). 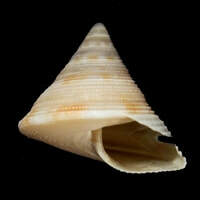 It can be easily separated from any other species by its uniquely wide slit. I personally think that P. metivieri should belong in the genus Bayerotrochus, as it appears most closely related to B. africanus and B. teramachii. 12. 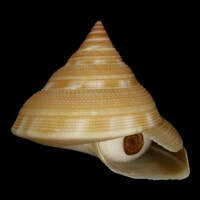 Perotrochus lucaya (Bayer, 1965) – endemic to the Bahamas. This species has both high- and low-spired forms. 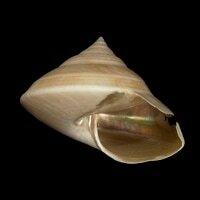 The following is an up-to-date full checklist of all living Pleurotomariidae species and subspecies. 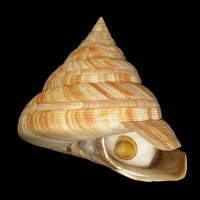 I have used the symbol * to indicate species that, at the time of writing, are easy to obtain. I would like to express my grateful thanks to Roberto Rodolico for taking the photographs and preparing them for publication. This article by John Batt was first published (with different illustrations) in two parts in our magazine Pallidula in October 2006 and October 2010.